Aaron and I went to Chicago for vaguely work related reasons. He has this client who he has become good friends with over 2ish years of working together on a product and this client was going to be in Chicago for a conference so we joined him. Aaron's client and his lovely wife stayed at the Conrad which, as it turns out, boasts some pretty amazing french toast. On Friday morning we met up at their hotel for a farewell breakfast and a little taste of the french toast we had been hearing about. When they told us it was the best french toast they'd ever had they weren't exaggerating. It was SO ridiculously good. About halfway through my breakfast I thought, "You know...I bet I can make this." The night after I got home I gave it a try and almost nailed it. One more shot and we've got a dang good creme brulee french toast that doesn't require any overnight waiting like other recipes I've seen. 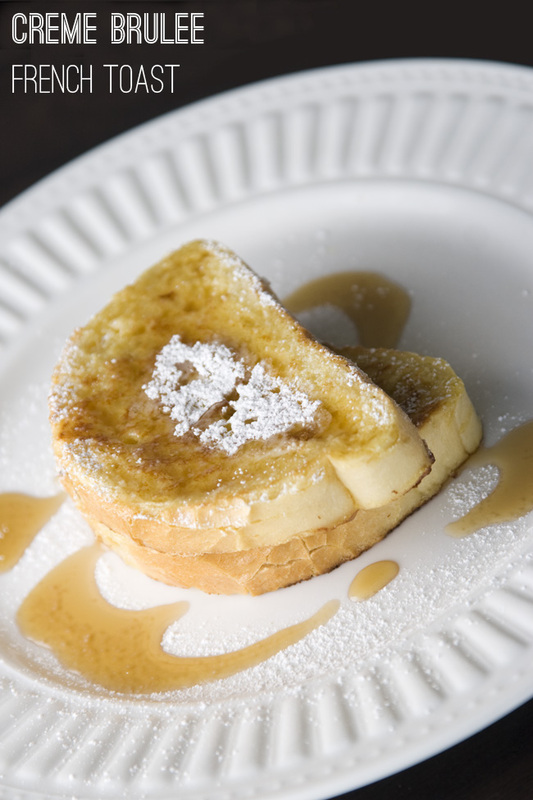 It's only slightly more work than your average french toast but with much higher payoff! Put egg, egg yolks, sugars and vanilla in a blender. Blend on medium-low speed until combined. In a saucepan, heat half-and-half until warm. Then, with blender running on low, add half-and-half to egg mixture in a thin stream until it's all combined. Heat frying pan over medium-low heat and grease with butter. Dunk bread slices in egg mixture and let cook until slightly browned. You should see some caramelized sugar on there. Flip and repeat on the other side. Watching what you eat? Try these whole wheat waffles or these apple yogurt pancakes for a lighter breakfast! Find all our family favorite recipes on Pinterest.